Set your table for a lovely dinner party or just enjoy the centerpiece on the table every day. 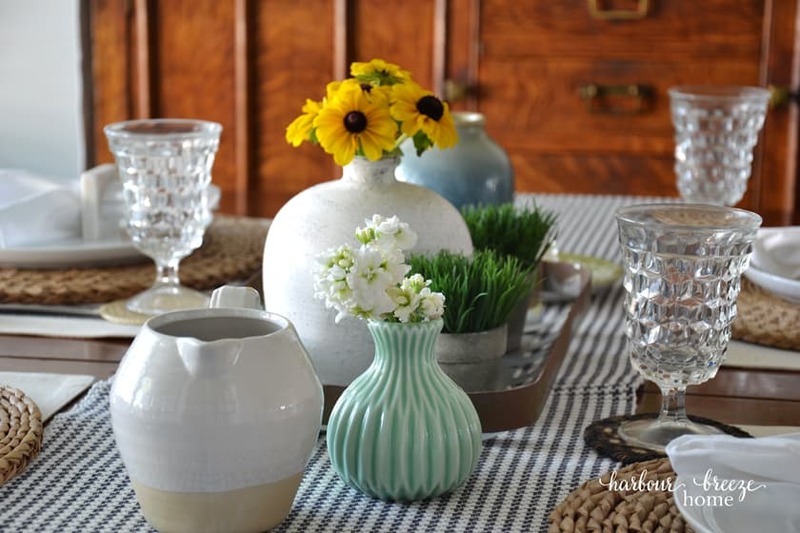 Here are 4 simple Spring table decor ideas you can try today! Since our Dining Room is an extension of the living room, I try to spiff them up to together and coordinate the decor. When I refreshed the living room the other day, I also worked in the Dining Room. I like to find a centerpiece that can be used to decorate the table on a daily basis, but isn’t so big that it fills up the whole space. I also like to have a quick and easy plan in place for simple dinner parties, too. 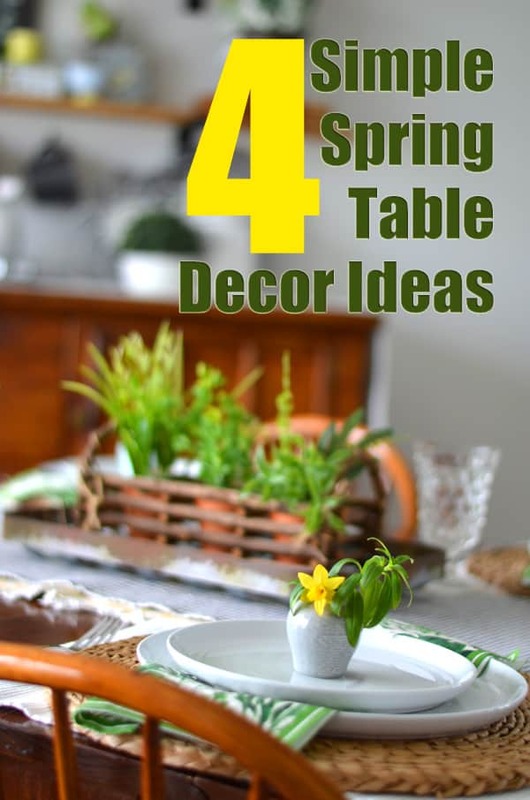 Here are 4 ideas of tables all set and ready to go. Which one is your favorite? 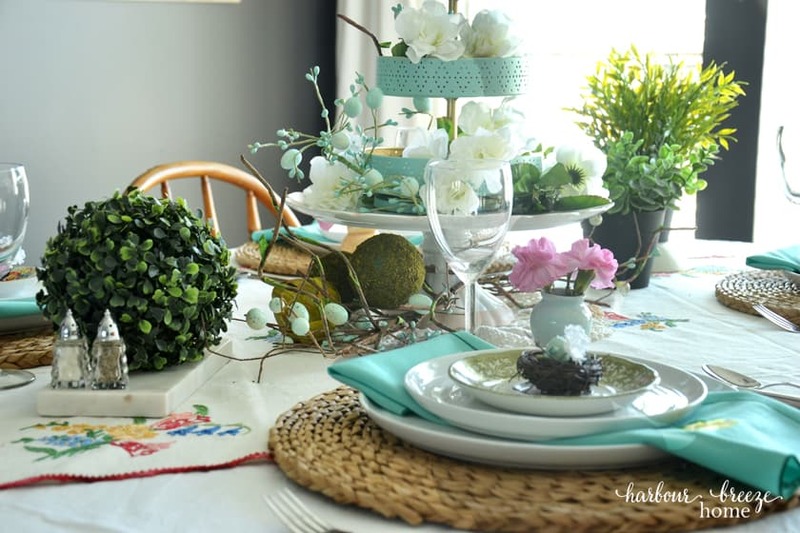 This year’s Spring table theme was inspired by some Spring green table napkins.They were a lovely, fresh, happy color and brightened up the space so nicely. 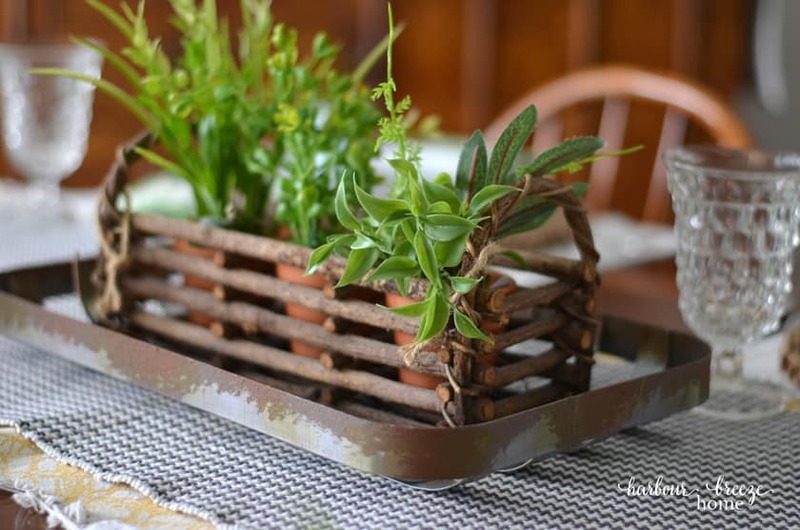 The centerpiece is a rectangle planter basket with branches with 3 tiny terracotta pots inside. Tucking in some faux greenery was all that was needed to make it both an every day and special occasion centerpiece. Setting it in a wire tobacco basket and layering table runners underneath gives it a farmhouse touch. To add a little interest to each place setting, I folded the napkin and placed it under the salad plate. 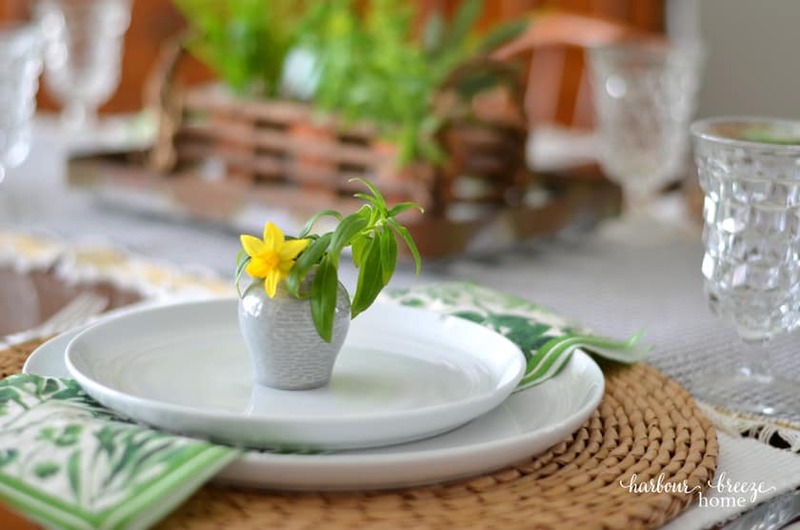 Then, I used tiny bud vases with cuttings from my patio for each plate. 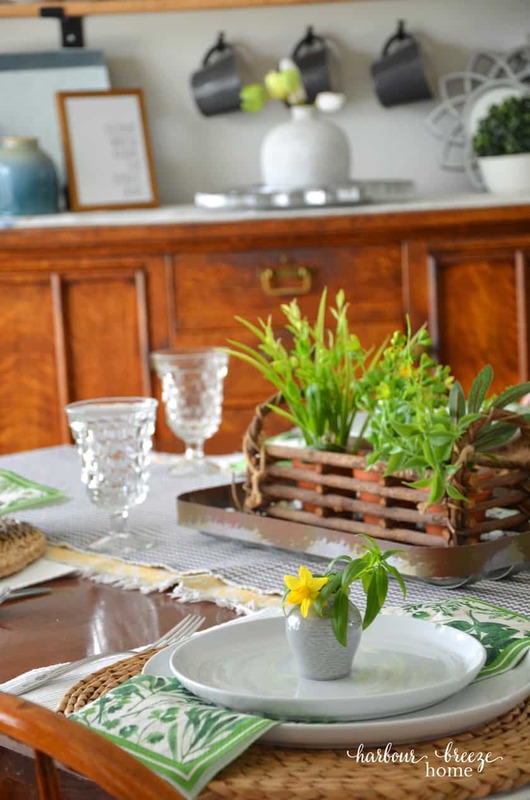 This simple and classic farmhouse table setting can be whipped together in no time at all. 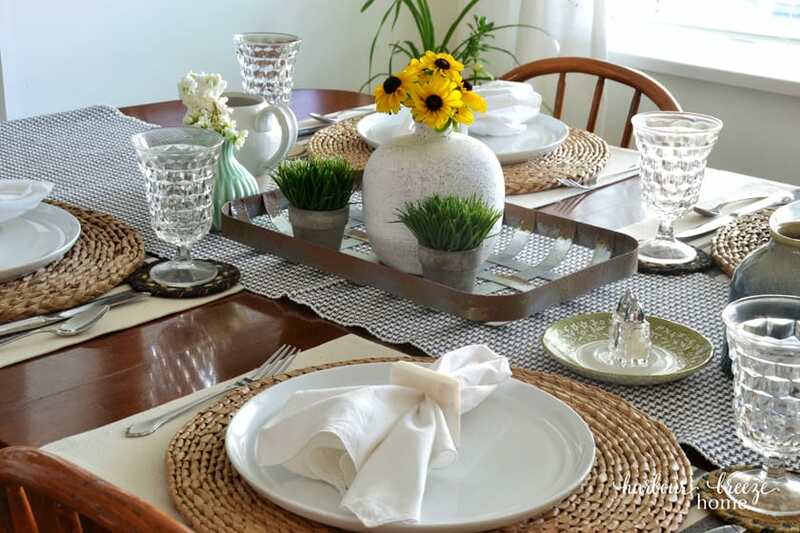 It uses my favorite neutral placemats and table runner as the base, and layers on the wicker chargers and white plates. A row of vases in different heights with cuttings from my flower bed are the centerpiece. To get all the details, check out this post. 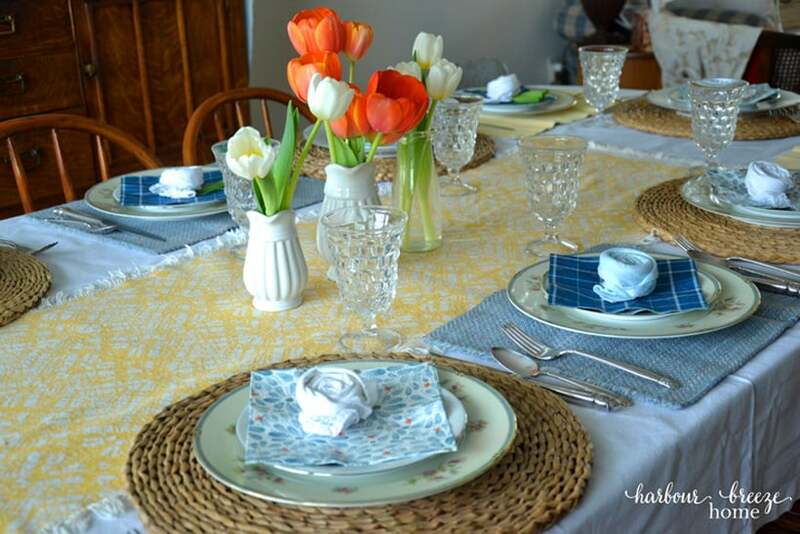 This bright and cheery table setting was inspired by a $5 goodwill challenge! 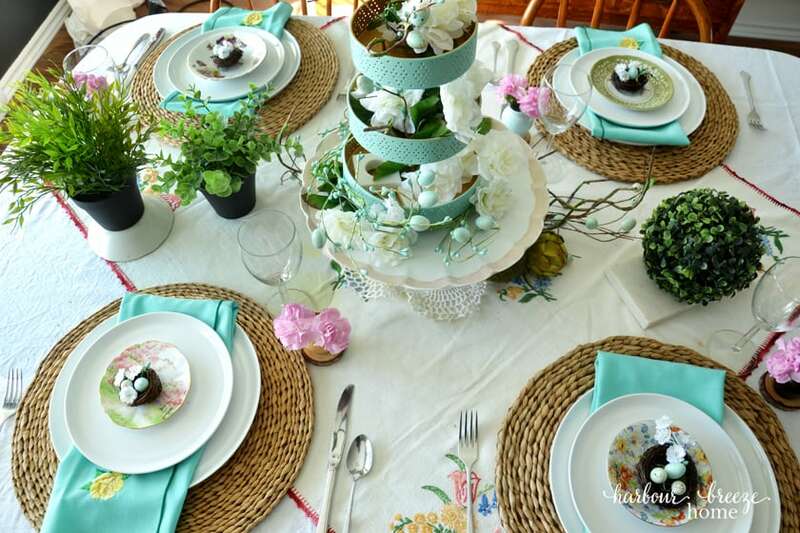 Finding some linen napkins and faux Easter greenery in aqua blues set the stage for this vintage inspired look. It was so fun to put together using old vintage china from my mom and Grandmas. 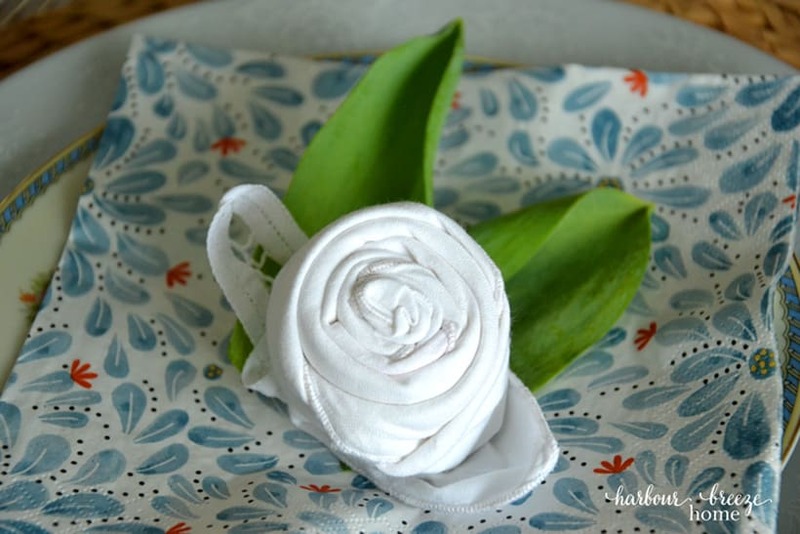 Folding cloth napkins is one of my favourite tricks when setting a pretty table. Adding pretty little napkin roses to the top of each placesetting gives it a fun and special extra touch. You can get all the details here. 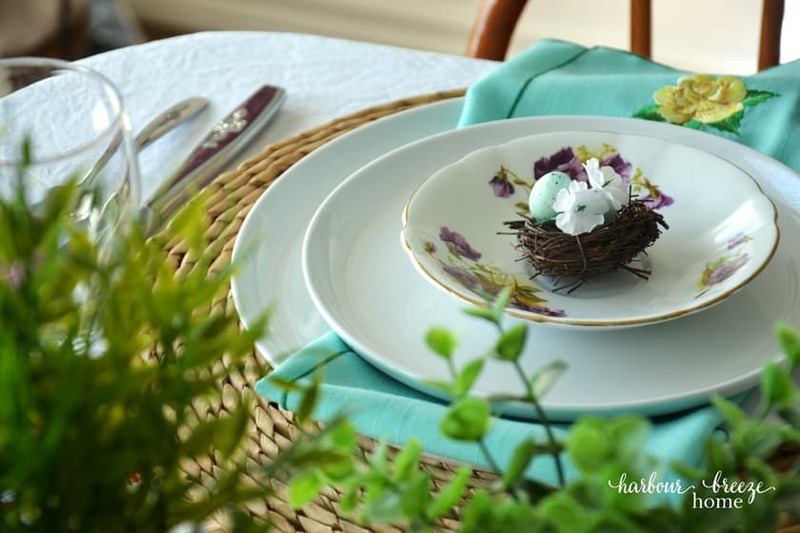 Do you see some similarities in all those table setting ideas? Since I live in a small space, I don’t have room for copious sets of dishes and table decor sets! So, I tend to stick with basics that I love and get different looks through accessories and napkins. You can find a list of table setting basics (with Christmas ideas) inspired by Joanna Gaines in this post. By far, I reach for the woven wicker chargers, white dishes, and gray checked runner the absolute most! I’ve linked similar ones in my Amazon Influencer Shop under “Table Setting Basics”. I hope that gives you some helpful tips as you may be planning ahead to some Spring guests. My favorite part of getting ready for a dinner party is setting the table! Love these! I need to get me some white dishes… white with some pretty embossed edge… but all white! My favourite part of entertaining is decoration and setting the table. I am so blessed that my husband does everything else. Shopping, cooking and cleaning. Can’t beat that for sure.